The title is currently held by Queen Elizabeth II, George VI's eldest daughter. Charles, Prince of Wales, was appointed her designated successor at the 2018 Commonwealth Heads of Government Meeting. The title was devised in the London Declaration as a result of discussions at the 1949 Commonwealth Prime Ministers' Conference. It is rendered in Latin as Consortionis Populorum Princeps. ^ Based on the London Declaration and does not match his accession as king on 11 December 1936. ^ Date of Elizabeth II's accession as Queen. ^ "About the commonwealth". www.gov.uk. The Foreign and Commonwealth office, UK. Retrieved 12 January 2018. ^ "Biography of Elizabeth II (UK)". archontology.org. ^ "Head of the Commonwealth". Commonwealth Secretariat. ^ "Mailbox". Royal Insight. September 2006. p. 3. Archived from the original on 19 November 2008. ^ Geddes, John (2012). "The day she descended into the fray". Maclean's (Special Commemorative Edition: The Diamond Jubilee: Celebrating 60 Remarkable years ed. ): 72. ^ MacQueen, Ken; Treble, Patricia (2012). "The Jewel in the Crown". Maclean's (Special Commemorative Edition: The Diamond Jubilee: Celebrating 60 Remarkable years ed. ): 43–44. ^ Landale, James (13 February 2018). "Commonwealth in secret succession plans". BBC News – via www.bbc.com. ^ "Charles wins support to head Commonwealth". New Zealand Herald. 28 November 2015. Retrieved 28 November 2015. ^ Mount, Harry (13 February 2018). "After seven decades of slogging around the globe, doesn't Prince Charles deserve to lead the Commonwealth?". The Telegraph – via www.telegraph.co.uk. ^ Mohabir, Nalini (15 February 2018). "The next head of the Commonwealth must not be a royal from Brexit Britain - Nalini Mohabir". The Guardian. ^ Palmer, Richard (13 February 2018). "Prince Charles 'might NOT be next head of Commonwealth if the Queen dies'". ^ Perring, Rebecca (13 February 2018). "'Disastrous consequences!' Anger at talks to block Charles' role as Head of Commonwealth". ^ "What Prince Charles should say to the Commonwealth - Coffee House". 18 February 2018. ^ Rayner, Gordon (27 November 2015). 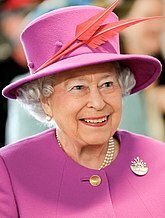 "State visit to Malta: Queen hints to sceptical leaders that Prince should be next Head of the Commonwealth". telegraph.co.uk. ^ "Prince Charles to be next Commonwealth head". BBC News. 20 April 2018. Retrieved 20 April 2018. ^ "Commonwealth Heads of Government Meeting 2018 - Leaders' Statement". The Commonwealth. The Commonwealth of Nations. 21 April 2018. Retrieved 21 April 2018. We recognise the role of The Queen in championing the Commonwealth and its peoples. The next Head of the Commonwealth shall be His Royal Highness Prince Charles, The Prince of Wales. ^ "Charles 'to be next Commonwealth head'". BBC News. 20 April 2018. Retrieved 20 April 2018. ^ "Prince Charles to succeed Queen as Commonwealth head". Sky News. 20 April 2018. Retrieved 20 April 2018.